As a neutral watching the game, it was a very entertaining 80 minutes, with the lead changing hands several times, often against the run of play. I had travelled to the Millennium Stadium with the Saraacens supporters. We had seats in the East stand, about 4 rows back. Good in theory, but pretty bad for the first 40 minutes on a sunny afternoon with the roof open - couldn't see a thing with the sun straight in our eyes. Eventually it dipped below the stadium roof, and I was able to get some half-decent photos. Paul Sackey scored a great try in the first half, and the teams went in 13-12 at half time. Things opened up a little in the second half, with the Tigers putting more points on the board than Wasps. Sackey managed another touchdown in the second half, along with team mate Danny Cipriani. 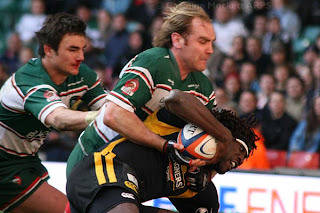 Whilst for the Tigers, Seru Rabeni, Dan Hipkiss and Martin Castrogiovanni all crossed. No-one was more surprised than the Prop himself, when Castrogiovanni found himself in space, ball in hand and the line 20m away. He lumbered forward and no-one was at home to defend. He did the most exuberant belly-flop to get his try that I've ever witnessed. Didn't realised Props bounce quite that well! In the end, Leicester were the deserved winners, and will go into the final with confidence after that performance. See more match photos from the game. I blog about web design and photography. Oh, and Rugby. I also have a new blog for 2008. This is a Flickr badge showing photos in a set called Saracens 07/08 Season. Make your own badge here.